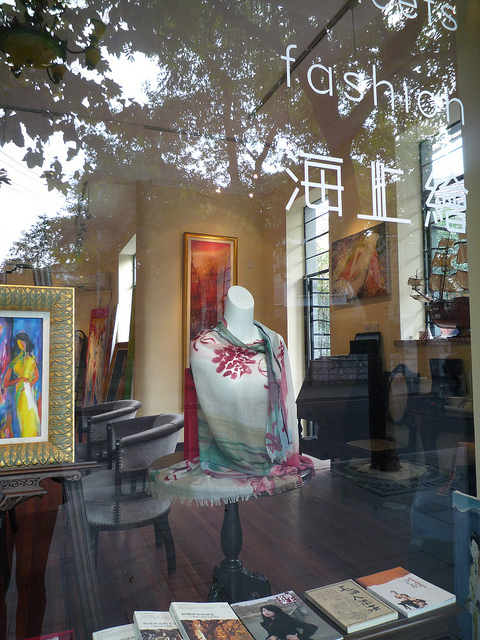 In the period 2010-2011, coinciding with the World Expo in Shanghai, Lu Schaper was invited by the famous Shanghai Story High-end Fashion chain to work with them as a freelance artist. She created about a dozen of different scarves, based on silk or cashmere. These scarves became bestsellers in the Shanghai Story shops. This picture was taken by the artist of a display of one of her scarves in the Shanghai Story shop window. This cashmere scarf design is based on a Chinese Opera story, Peony Pavillion. See also blog post Where art meets fashion.